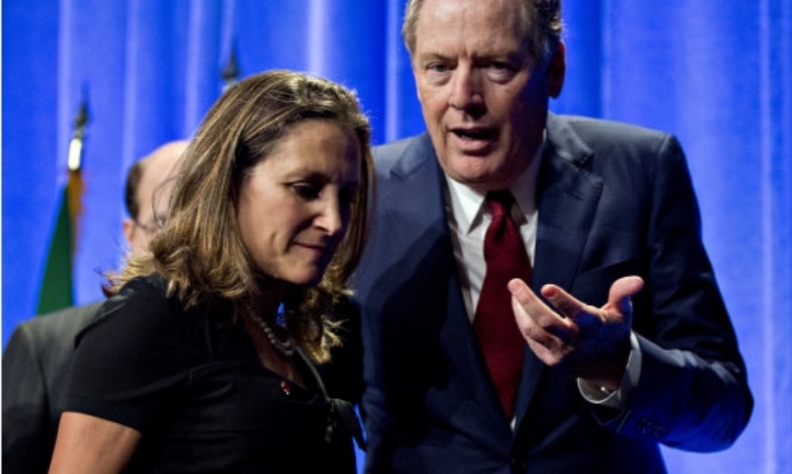 Robert Lighthizer, U.S. trade representative, speaks to Chrystia Freeland, minister of foreign affairs earlier this year. OTTAWA — Foreign Affairs Minister Chrystia Freeland says she's "very encouraged" by signals from Washington that the United States and Mexico are close to figuring out their bilateral issues within the three-country North American Free Trade Agreement. "We are very encouraged by what we're hearing from our NAFTA partners," Freeland said in Nanaimo, B.C., where she's taking part in a Liberal government cabinet retreat. "What we've agreed with the U.S. and Mexico is, once the work on those bilateral issues is done, then Canada is looking forward to joining the negotiation and a swift conclusion of the NAFTA negotiations." There's optimism that U.S. Trade Representative Robert Lighthizer and Mexican Economy Minister Ildefonso Guajardo could conclude their face-to-face negotiations as early as this week — and open the door for Canada to re-enter the talks. A report by Politico, based on information from unidentified sources, said the White House is expected to announce a "handshake" deal between the U.S. and Mexico on Thursday. U.S. President Donald Trump is expected to attend the announcement, the report said. In Washington, Guajardo said Wednesday that he hoped to have a solution in "the next couple of hours, or couple of days." However, on the possibility of a handshake deal, Guajardo said it would have to involve all three countries. "What we're doing here is trying to get and solve the issues that are most important between the U.S. and Mexico — that will lead to a trilateral meeting with Canada," he said. "I think the handshake happens when everybody's done." "NAFTA is a trilateral agreement, but inside that agreement there are a lot of issues that are chiefly bilateral and that is what they're focused on," Freeland said. The rules of origin on cars is an issue that concerns all three countries — and one where detail matters, she added. "And Canada will very much have a voice in the finalization of all of this." "We're not negotiating with Canada right now," the president said during a televised cabinet meeting. "Their tariffs are too high, their barriers are too strong, so we're not even talking to them right now. But we'll see how that works out. It will only work out to our favour." The Wall Street Journal, citing unnamed sources, reported that the incoming government of Mexican president-elect Andres Manuel Lopez Obrador wants energy investment rules kept out of any new NAFTA. Mexico's current government, which is overseeing negotiations until Obrador takes office Dec. 1, has already agreed to such a chapter. Energy, the Journal reported, was left out of the original NAFTA when it came into force 24 years ago because Mexico's state monopoly on oil didn't allow private investment in the industry. In 2013, however, the Mexican government opened up the industry to investment — a decision opposed by Obrador.